Johanna Goldfarb, MD is a physician at Cleveland Clinic. 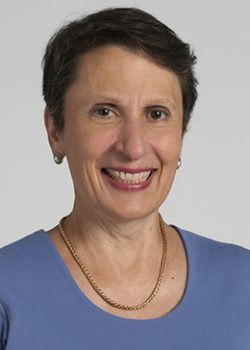 She teaches at and is on the faculty at the Cleveland Clinic Lerner College of Medicine at Case Western Reserve University. Dr. Goldfarb is trained in Pediatric Infectious Diseases. “The most important way we teach professionalism to our trainees is by how we ourselves practice medicine. We have to role-model professionalism—when we are kind, attentive to details; when we recognize when we do not know the answer and ask for help, when we put the patient first always, those are true teachable moments. Another method that complements this is through discussions and formal teaching. Perhaps the best way that I have found to do this is in small groups, enabling and encouraging the trainees to do the teaching. In these small-group meetings, we promise each other confidentiality and begin in a circle. Two staff members meet with the pediatric residents and then the fellows in a different group. The trainees are asked to tell about a time, either their ‘most proud or ‘most disturbing,’ over the last year. We ask what professional qualities each story is about and by the time we have gone around the circle, we have often fully outlined the commitments and/or principles outlined in the Physician Charter. The stories that are shared usually center around the impact of good communication between physicians, nurses and social workers; about listening attentively to patients and figuring out a diagnosis or at least a course or approach to an often difficult situation. They are stories about getting the support of a colleague at a time of personal need, stories of honesty when an error has occurred, about making an extra effort for a patient in need who would otherwise have been lost in a large system.